1500: So the Hamilton resurgence gathers pace, but let's not be writing off Red Bull and Ferrari just yet. Like McLaren, they also completed extensive practice schedules in Friday's two free practice sessions and look to be in excellent shape themselves. Saturday brings us a third and final practice run at 1000 BST before qualifying at 1300, and then we turn out attention to Sunday. Race day. You can read about and watch what happened on Friday in Lawrence Barretto and Sarah Holt's report - and be sure to keep your eyes across bbc.co.uk/sport for all the very latest on and off-track news from Hungary and the world of Formula 1. I'll see you back here at 0900 BST on Saturday. Viszontlátásra for now! Team Lotus boss Tony Fernandes on Twitter: "Good drive from Jarno today. Very close to the middle of the pack. Heikki has issues with gears but okay time. Jarno very happy with car." Press Association F1 correspondent Ian Parkes on Twitter: "A resurgent Lewis Hamilton also takes the honours in 2nd practice. Time still 2.5secs slower than last year's pole so plenty more to come." McLaren reserve driver Gary Paffett on Twitter: "A good day for the McLaren boys at Hungary today. @LewisHamilton P1 and @JensonButton P3 in second practice session." 1440: Elsewhere, Nico Rosberg outperforms Mercedes team-mate Michael Schumacher yet again, Force India grab the ninth and 10th-fastest times, Sauber the 11th and 12 and Williams' Rubens Barrichello and Pastor Maldonado struggle through in 13th and 15th. Tonio Luizzi finishes rock bottom, 7.237 seconds of the pace in his Hispania. 1430: Hmmm... my prediction of late leaderboard movement didn't exactly come to fruition. Why? Because many of the drivers opted to run the soft 'prime' tyres instead of the super-soft 'option' variant. Lewis Hamilton takes the headlines with a lap of one minute, 21.018 seconds. Ferrari's Fernando Alonso (1:21.259) is second fastest and Hamilton's McLaren team-mate Jenson Button third with a 1:21.322. Then come the Red Bulls of Mark Webber (1:21.508) and Sebastian Vettel (1:21.549). 1247: McLaren tweet to confirm my 0948 suspicion that Button has been to the barbers for a short back and sides. "Judging by your twitter comments, you love JB's barnet!" they write. 1420: Felipe Massa comes in for a set of super-soft tyres. "Good programme by Ferrari today," says Team Lotus reserve driver Karun Chandhok in the commentary box. "They're managing the session really well, they're going to have a lot of good information to look over tonight." Meanwhile, Red Bull are cranking up the pace late doors. Vettel looking to hunt down Hamilton. Makes for an exciting final 10 minutes and, beyond that, a potentially thrilling qualifying session tomorrow and race on Sunday. HannahPaice on Twitter: "BBC have done an amazing job with F1 over the last couple of years and have made it watchable for all. Such a shame the news today." Gus, London, via text on 81111: "Have you noticed that no-one thinks Vettel is the best driver despite leading the championship by a whopping margin? Everyone knows that in almost equal cars, Hamilton and Alonso will beat him. Simple." 1415: Jenson Button, desperate for a big weekend, is currently third fastest. He's scorching round on the super-soft tyres but his best effort of 1:21.322 is still 0.304 seconds slower than team-mate Hamilton's 1:21.018. Alonso splits the McLarens, with Webber and Vettel completing the top five. Massa, Rosberg, Schumacher, Di Resta and Sutil also find themselves in the top 10. 1410: A quick pit-stop rehearsal for Felipe Massa. In, up, down, out. He's down in sixth, the Brazilian, following a lap of 1:22.099 earlier on. That's 1.081 seconds off Hamilton's leading time. which will take some beating. Twenty minutes left before the chequered flag. Virgin Racing driver Timo Glock on Twitter: "Different rear bars and slight changes on the front wing. The sun is out finally!!" 1400: Back to the racing and Lewis Hamilton has flown round the Hungaroring to post a lap of 1:21.018 and move top of the timesheets by 0.241 seconds. Blimey, terrific effort. The Ferraris of Alonso and Massa are now going to focus on long stints using the option and prime tyres respectively, so we might not see any lightning times from them for a while. 1355: A steady stream of tweets and texts flowing in to us regarding today's big news of the TV deal. Barbara Slater, director of BBC Sport, says: "We are absolutely delighted that F1 will remain on the BBC. The sport has never been more popular with TV audiences at a 10-year high and the BBC has always stated its commitment to the big national sporting moments. With this new deal not only have we delivered significant savings but we have also ensured that through our live and extended highlights coverage all the action continues to be available to licence-fee payers." Renault GP on Twitter: "Nick's back in, reports car better but the rear still too loose, car too bouncy over the bumps." 1350: Little movement in the top 10 at present, with many of the big guns heading back to the pits. Still a good 40 mins remaining today, so plenty of time left to post so quick times on the super-soft tyres. BBC F1 pit-lane reporter Ted Kravitz: "To answer SamDanger's question, the biggest factors in McLaren's performance gain have have actually been ones over which they've had no control. The exhaust-blown diffuser rule change at Silverstone cost them around 0.8 seconds per lap so when that change was abandoned in Germany, they recovered by that amount. The second factor was the cool weather in Germany meant their tyres lasted longer than has been the norm. Lewis Hamilton admitted after the race that the tyres lasted much longer than he expected. The secondary factors have been an upgraded exhaust, front wing and sidepod fins, as well as an inspired drive by Hamilton." 1345: Analyst Anthony Davidson and Lotus reserve Karun Chandhok are asked on the BBC F1 commentary which two drivers they would have in their cars if they were team bosses, and they are both unequivocal... "Fernando and Lewis," says Davidson. "Lewis and Fernando," says Chandhok. Commentator David Croft responds: "You've just given yourself a massive headache there." 1340: Brilliant effort from Fernando Alonso on the super-soft tyres to post a new fastest lap - a 1:21.259. That takes him 0.832 seconds clear of second-fastest Jenson Button. Alonso's team-mate Felipe Massa runs wide and Williams' Pastor Maldonado pits with a puncture, but few other problems to report. 1335: Lewis Hamilton shoots into the run-off at Turn One after riding a bump coming into the corner. He hits his steering wheel in frustration as if to say 'what more can I do?' - he gets everything right only for an annoying little quirk of the track to scupper his lap. BBC F1 pit-lane reporter Ted Kravitz: "The drivers are using the DRS overtaking aid a lot during the early laps, which proves these are qualifying-spec performance runs. The teams will soon try the red-striped super-soft tyre to see how many laps they can get out of it. The only races this tyre has been used at so far have been Monaco (which is very kind on tyres) and Canada (when it wasn't raced much because of the rain), so this weekend will be the toughest test so far for this Pirelli tyre. Expect not much more than 23 to 25 laps maximum for the super-soft - cooler temperatures won't necessarily help degradation as the super soft is designed to work in hot temperatures, which point to a two- or three-stop race." BBC 5 live analyst Anthony Davidson: "Nick Heidfeld has had one very good race in my opinion, in Malaysia, where he got the best out of the car. It was a Robert Kubica kind of performance, and we haven't seen that since that race. I thought we'd see more of that. But he's definitely gone off the boil and Vitaly Petrov has come to be seen as the team leader, which I've been very surprised by." 1325: A lap of 1:22.070 sees Fernando Alonso regain top spot from Button. Vettel is up to third with Massa fourth, Hamilton fifth and Webber sixth but more than a second off the pace. BBC pit-lane reports Jennie Gow tells us of a new rear wing for struggling Williams this weekend. "They're having a tough time but they're doing lots of testing in a bid to improve," she says of the team and drivers Rubens Barrichello and Pastor Maldonado. SamDanger on Twitter: "Any clue as to where McLaren have made gains in the performance of their car in the past couple of races?" BBC F1 pit-lane reporter Lee McKenzie: "Hungary is always a nice race to come to. I first came here in 2004 to cover F3000 when Hispania driver Tonio Liuzzi was racing for Arden, owned and run by Red Bull boss Christian Horner! While we have all progressed to F1, in our various roles, not much else has changed at the Hungaroring. The water park still overlooks the twists and turns of the circuit and the drivers have mixed feelings about being here because it often doesn't produce very exciting races. But Ferrari's Fernando Alonso loves it, as does Jenson Button, because both of them took their first F1 races here. Overtaking has not been too prevalent in races gone by but with DRS and Kers this could be as exciting a race as many of the others this season." 1315: To the track, where Jenson Button leapfrogs Fernando Alonso with a lap of one minutes 22.091 seconds to top the timesheets. Alonso's Ferrari team-mate Felipe Massa, meanwhile, locks his tyres going into Turn Two, causing a flat spot - and that leads to a spin at Turn 12. Back to the pits, Felipe. 1310: By the way, we're trialling high-definition streaming on Formula 1 for UK users over the Hungarian Grand Prix this weekend, for both qualifying and the race. The system will automatically detect your broadband connection and will give you HD coverage if it is working fast enough. Full details can be found on the F1 index of the BBC Sport website. 1308: No 5 live sports extra commentary of FP2, I'm afraid. They're over covering the second Test between England and India so you'll have to make do with the Red Button and website. 1305: Toro Rosso have sent drivers Jaime Alguersuari and Sebastien Buemi out on the soft 'option' tyres instead of the super-softs that everyone was using this morning. That suggests they know a spot of rain is in the air. Could make for an interesting afternoon. Team Lotus reserve driver Karun Chandhok: "We ran the soft tyres in cooler conditions at the Nurburgring and they worked OK. The super-soft will work even better here. I think if we had the medium, it would be a problem." Ferrari on Twitter: "This session will be aimed more to the tyre comparison on short and long distance." 1255: Back up and running with TV pictures on the Red Button and right here online. We're given a nice bird's eye view of the 4.381km track, which looks resplendent in the Budapest countryside. Not a great deal of sunshine, mind. It's pretty cold and gloomy out there, with a hint of rain in the air. BBC Sport's Sarah Holt at the Hungaroring: "Over at McLaren HQ, there was a relaxed atmosphere at lunchtime. Jenson Button, who was fifth fastest this morning, was dashing between the garage and the motorhome. His model girlfriend Jessica Michibata is back for this race. As ever, the team say it's too early to make predictions on whether this morning's pacesetter Lewis Hamilton will carry his form through to Sunday. But technical director Paddy Lowe says the team have added a few bits and pieces to the car since Hamilton's win in Germany. Some of those bits will probably be aerodynamic tweaks because this is a track where you need to run more downforce than at other circuits." 1250: It wasn't so long ago that we were talking about Sebastian Vettel and Red Bull running away with the drivers' and constructors' championships. Suddenly Lewis Hamilton and McLaren are back. And how. Meanwhile, Ferrari's Fernando is right there in the mix too following his victory at the British Grand Prix. A boring season? Pah! BBC Sport's Sarah Holt at the Hungaroring: "Red Bull team boss Christian Horner has answered a few of those burning questions from first practice. 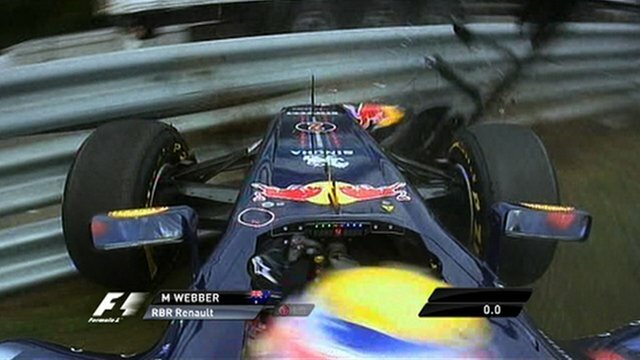 First of all, he says the damage to Mark Webber's car is 'superficial' after the Australian crashed this morning. The intrigue about what is wrong with Sebastian Vettel's bandaged right hand has also been solved. The world champ cut his palm last week and is just keeping it under wraps to stop any dirt getting in the way of the healing process. And on the issue of whether Red Bull can dominate here, Horner told me: 'I think it'll be tighter than last year.'" Daily Telegraph F1 correspondent Tom Cary on Twitter: "Amazing reaction to BBC/Sky F1 news this morning. Overwhelmingly negative it has to be said. Lots of it hysterical." Sir Stirling Moss on Twitter: "#F1 has won many new fans because of the #BBCF1 coverage the last few years, the new deal will lose those not prepared to pay." 1232: Now, I will dip into the TV debate now and again - I fully appreciate how big a deal it is and the furore it's causing - but there's only so much we can say here in the live text. 1230: In case you had forgotten, there is actually some action taking place on the track today. I know the TV deal is extremely important but so is the racing itself, and that's what we're going to focus on over the next couple of hours or so. 1055: Time for a quick break before second practice but do have a read of Sarah Holt's FP1 report while I'm away. There is, of course, another piece of important news doing the rounds today - the BBC and Sky Sports will broadcast Formula 1 in the UK between 2012 and 2018 under a new rights deal. As I'm sure you will understand, I have to deal with the subject fairly sensitively in this live text commentary. Which is why I haven't been able to include as many tweets and texts as normal. But make sure you keep them coming and I'll use as many as I can once FP2 gets up and running. Deal? Great stuff. Red Bull Racing on Twitter: "Fear not, Webber fans. Mark's car will be fixed in time for FP2." 1045: A whopping 6.554 seconds separate Hamilton from bottom-of-the-pile Daniel Ricciardo, with the likes of Liuzzi, D'Ambrossio, Glock, Trulli and Kovalainen also way down the field. Encouraging morning for Nico Rosberg, who outperforms Mercedes team-mate Michael Schumacher to go seventh fastest, while Sauber's Sergio Perez should also be happy with ninth fastest. While there's not a huge amount we can read into these times, FP2 will give us a further indication of how the teams are shaping up for qualifying (Saturday) and the race (Sunday). Press Association F1 correspondent Ian Parkes on Twitter: "Hamilton clearly still on a high from Sunday's win in Germany as he tops first practice times. Temp of only 20 degrees C suiting McLaren." 1030: And down comes the chequered flag on FP1. Lewis Hamilton finishes at the head of the timesheets with a lap of one minute, 23.350 seconds from 19 laps. Sebastian Vettel puts in 24 laps but can only manage a 1:23.564 and Fernando Alonso is third fastest with a 1:23.642. So, unlike last year, Red Bull will not find themselves top of the charts in every single session. The title race appears to be alive. Can only be a good thing for the sport, no? BBC F1 pit-lane reporter Ted Kravitz: "As usual, the sector times reveal where each car is strong. Sector One in Hungary is mostly about gaining time on braking and traction, and Sebastian Vettel is quickest there. Sector Two is all about downforce, as the cars turn through the medium- and slow-speed section which flows through a series of corners - and intriguingly, Felipe Massa's Ferrari is currently quickest there, followed closely by Fernando Alonso in the sister Ferrari. The third sector is more like the first, but rewards mechanical grip through the slow last two hairpin corners and that's where Lewis Hamilton is strong, alongside Mark Webber, who aced it before his crash. Early indications, then, point to another three way fight between Red Bull, Ferrari and McLaren this weekend. If that turns out to be the case, that would be very different from last year, when Red Bull were untouchable in Hungary." 1028: Hamilton sets the fastest first and second sector times before being held up behind traffic. Jaime Alguersuari to be precise. Remarkably, he harasses and then overtakes the Spaniard as if they were racing. "That was brilliant," says commentator David Croft of BBC Radio 5 live. "He's totally wired up and in the zone at the moment." That said, I'm seeing a flat spot on his front right tyre. Looks like he been braking too hard. A bit over-exuberant? Chill, Lewis, it's only Friday! BBC 5 live analyst Anthony Davidson: "You'd have to say Red Bull are not looking anything like as dominant as they did at this stage last year - when it was obvious from the first session they were well ahead. You never know, of course. There are all sorts of ways of disguising your pace. But that's the way it looks at the moment." 1024: Hamilton remains the man to beat. Was Germany a defining moment in the 2011 season? Will Hamilton's victory prove the turning point. I think the Red Bulls of Vettel and Webber and the Ferrari of Fernando Alonso will have something to say about that but, at present, Lewis is the one we're all talking about. BBC Radio 5 live pit-lane reporter Jennie Gow: "I'm down at Force India and Adrian Sutil is having a lot of work done on his car. They had a new diffuser in the last round which they were happy with and they're doing a test on it this weekend. They're also doing some front wing settings work but just as a test." BBC Sport's Sarah Holt at the Hungaroring: "Sebastian Vettel was in no mood to explain why he finished off the podium for the first time this season at the last race in Germany. The championship leader has been in supreme form, winning six races for Red Bull, but just managed to claim fourth at the Nurburgring. 'There's no point trying to find excuses,' said Vettel, who went on to list a few. 'I didn't feel comfortable Friday to Sunday. It was tricky with the conditions, it was very cold, Mark [Webber] was quicker all weekend and I never really found good balance. We have understood most of it but now we need to refocus on this race. We want to be on the top again.'" 1020: The good times continue to roll for Lewis Hamilton. He's just clocked a 1:23.350 to top the timesheets, 0.214secs quicker than Vettel and 0.292 than Alonso. Webber and Button complete the top five and the top seven are all within a second of Hamilton's pace. 1015: We're expecting the track to completely dry out by the time the second free practice session starts 1300 BST. The Hungarian Grand Prix is typically associated with high temperatures and only once has it been a wet race - in 2006. Team Lotus on Twitter: "Looks like Webber has just dropped it and lost the nose. Shows how tricky conditions are out there this morning with some water around." 1010: Off goes Mark Webber at Turn Nine. Shoots into a barrier. Bosh! Destroys nose cone, front wing and front right tyre. Clear suspension damage. Cabling all over the shop. Muddy tyres too. Not a good start to the weekend for Aussie Grit. BBC F1 commentator Anthony Davidson: "The Hungaroring is one of those tracks where you have to dial yourself in. It's like Monaco in many respects because it takes time to find your own rhythm and explore the limits of the track." 1005: Rubens Barrichello uses the team radio to complain of poor rear grip. Troubled season for Williams. Sad times for the historic team. BBC Sport's Sarah Holt at the Hungaroring: "Renault reserve Bruno Senna gets his first drive of the season as he replaces Nick Heidfeld in first practice. The Brazilian, who raced for Hispania in 2010, is hoping to use the opportunity to put himself in the shop window for 2012. 'The plan is to get back in a seat for next year,' said Senna. 'It depends on the work I do here and potential backing from sponsors. Of course there's pressure because I want to do well but there's no point trying to be a hero and end up being a fool. All I want to do is get in the car. The last time I drove was in February. There's no point trying for a miracle.'" 1000: That man Vettel goes top of the timesheets with a 1:23.564. It would be some statement of intent if the reigning world champion and current points leader could get back to winning ways with victory on Sunday. He leads by 0.078secs from Alonso and 0.102 from team-mate Webber. Massa and Hamilton are also within a second of Vettel, while Schumacher is 1.013secs off the pace and Button 1.419secs. 0955: Jennie - standing in for Natalie Pinkham today - also points out that Sebastian Vettel is wearing a bandage on his right hand. "Nothing major," she reports. Fancy Seba to bounce back from his recent disappointment this weekend? Send me your opinions and predictions by Twitter and text. BBC Radio 5 live pit-lane reporter Jennie Gow: "I was talking to Jenson Button and he said his dad lacks commitment when it comes to attending races. This is Button's 200th race and his dad has only been to 199 of them." 0948: A few familiar faces in the top six - Alonso, Webber, Vettel Massa, Hamilton and Button. Just seen pictures of Jenson in the McLaren garage... is that a short back and sides? Looking slick. Sauber managing director Monisha Kaltenborn on the decision to re-sign Kamui Kobayashi and Sergio Perez for 2012: "The decision was not difficult based on their performances all season. Kamui has done a fantastic job leading the team. Sergio has excited all the fans and exceeded our expectations." BBC F1 pit-lane reporter Lee McKenzie: "On Thursday I spoke to Kamui Kobayashi and Sergio Perez, who were both delighted to have signed for another season with Sauber. Kobayashi was talking about how much the team had progressed since he first joined them in 2010 and it was this progression that encouraged him to stay. Sergio Perez echoed that thought but added he was so grateful to be given his first chance in F1 and enjoyed working with all the guys from the Swiss outfit." 0940: Time for Fernando Alonso to make his mark. The Spanish double world champion - and birthday boy - goes quickest by half a second from Hamilton with a 1:23.642. Fine work, 'Nando. Tim, Basingstoke, via text on 81111: "McLaren seem to be running a very steep rear wing, like previous races they are the only team that you can visibly see the air and moisture streaming off the wing. Is there an underlying downforce issue here??" BBC F1 pit-lane reporter Ted Kravitz: "Williams have a new engine cover at this race, it's a direct copy of Red Bull's, with an oval air exit venting hot air over the lower beam of the rear wing. Williams are the second team to copy this idea of Red Bull's, after Ferrari, even though the Italian team have since reverted to their old engine cover due to the cooler conditions at recent races." 0935: Talking of Hamilton, he's just gone and usurped Buemi atop the timesheets. A lap of 1:24.284 does the trick. Team-mate Jenson Button sits second and Felipe Massa third. Big weekend for Button, this, after back-to-back retirements. BBC Sport's Sarah Holt at the Hungaroring: "David, it's interesting that you mention Lewis Hamilton dashing off to prepare for this weekend's Hungarian GP because he reckons it was a good dose of rest and recuperation that helped inspire his win last Sunday in Germany. 'I came into the weekend a lot more refreshed,' said Hamilton, who was in good form in Hungary. 'At [the last race] in Silverstone, I hadn't trained for four weeks and with that break I was able to train every day and get my body feeling fresher. I came there with a clear mind and I'd eaten at the right times. It might have made a bigger difference that I thought.' Hamilton has already ruled out challenging Red Bull for pole this weekend but he has his eye on another close battle on Sunday." BBC F1 commentator Anthony Davidson: "This is a Red Bull track as it's made up of medium speed corners. The second sector in the Nurburgring was all medium corners and that was the section where the Red Bull was consistently faster so we should expect them to have the advantage here." 0925: Excuse the delay, a few technical probs. Back up and running now, though. As is Sebastien Buemi, who has posted the fastest lap so far - an effort of one minute 27.058 seconds. Time for Toro Rosso to up their game and it's so far so good. 0912: Back to the new F1 TV deal for a moment. BBC Sport's Dan Roan has been speaking to Bernie Ecclestone and here's what the F1 boss had to say: "It's super for F1. It will mean a lot more coverage for the sport. There'll be highlights as well as live coverage on two different networks now so we get the best of both worlds." When asked whether he felt it was a shame a terrestrial broadcaster would no longer be showing every race live he said: "It was not us who made that decision". 0910: Most of the teams have sent their men out for installation laps and Ferrari are reporting a small fire in Fernando Alonso's car. Didn't take that birthday cake and candles in the cockpit with him, did he? 0900: Feel free to send us your views and questions on that and anything else F1 or Hungarian Grand Prix-related. Not every comment can be used but I'll do my damnedest to keep you happy. You can tweet me @bbcsport_david using the Twitter hashtag #BBCF1 or text in via access number 81111 (UK). Get those fingers tapping. 0858: No surprise to see so many of you talking about the big news of the day. For those who haven't already heard, the BBC and Sky Sports will broadcast Formula 1 in the UK between 2012 and 2018 under a new rights deal. The BBC has been the exclusive broadcaster of F1 in the UK since 2009 but its contract with Formula One Management was due to expire after the 2013 season. Sky Sports will show every race, qualifying session and practice live. BBC Sport will broadcast half the races live, as well as the qualifying and practice sessions from those races. BBC Sport's Sarah Holt at the Hungaroring: "Fernando Alonso is celebrating turning 30 on Friday - and there's bound to be some biscotti, if not cake, on offer at Ferrari HQ. The Spanish driver is being compared to Michael Schumacher who, just like Alonso, had two world titles under his belt at 30, before taking five more after joining Ferrari. But how did Alonso like the comparison? 'I never thought I'd have two world championships at 30 to be honest,' Alonso said. 'I knew how difficult it is to succeed in Formula 1 and I was extremely lucky. I'm not thinking to have seven world titles as [Schumacher] has at 42-years-old. F1 is so competitive, so close, so it's hard to see such a dominant figure again. Seven will be a record that will stay for many, many years.'" 0845: Holty, of course, is our omnipresent trackside reporter and she'll be feeding into this live text commentary all weekend, bringing you all the latest news and gossip from the Hungaroring. I'll do my best to offer you a blow-by-blow account of today's two free practice session, the first of which starts at 0900 and can be viewed on the Red Button and online, while audio coverage comes courtesy of 5 live sports extra. BBC Sport's Sarah Holt at the Hungaroring: "Just four short days after stepping out of the cars in Germany, the drivers resume racing in Hungary before breaking up for the summer holidays. The Hungaroring is a mighty challenge for the Formula 1 field to get their teeth into before the August vacation. It's a circuit that is compared to Monaco and its low-speed, high-downforce nature can make it tricky for drivers to get into a rhythm. The traditionally low-grip track surface can also evolve by up to one second a lap. Alas the traditional sunshine skies of Hungary seem to have abandoned us. It's overcast and fairly windy for first practice." 0840: A warm welcome to the 2011 Hungarian Grand Prix - round 11 of the 19-race calendar. It doesn't take a mathematician to work out that means we're into the second half of the season. The business end. This is where it gets really tasty. 0830: The champagne corks had barely finished popping in McLaren's garage at the Nurburgring by the time Lewis Hamilton dashed off to prepare for his next assignment. A couple of days training in the mountains above his Geneva home and then back to business. His victory at the German Grand Prix was already history. The title race was alive. His mind had switched to the Hungaroring. No time for resting on your laurels in this sport.